Ever wonder why after all of your lessons and practice, you still struggle to improve your game? Or ever wonder how it can be that your performance is great during practice, yet when the heat is on — you choke? 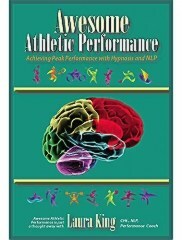 Retrain your brain with Laura King’s Awesome Athletic Performance book. Every athlete is looking to recreate those moments of flow and being in the zone, where their every movement is efficient and effective. Everything they think and do moves them closer to their goals for their athletic performance. No matter what your sport is – skiing, running, lacrosse, volleyball, football, swimming soccer or golf – there are actions you can take to improve the probability that you’ll spend more time in your zone and less time berating yourself and throwing your club (or bat, racket, etc.). Author and Sports Hypnotist, Laura King, has compiled a list of 6 keys to Awesome Athletic Performance that are universal for success. Once you understand the process by reading Awesome Athletic Performance, check out Laura’s Complete Awesome Athletic Performance Hypnosis CD Series. Although Laura provides the script and teaches you how to write your own script, why write and record your own self-hypnosis scripts when Laura has already recorded them for you? Start today with Awesome Athletic Performance.